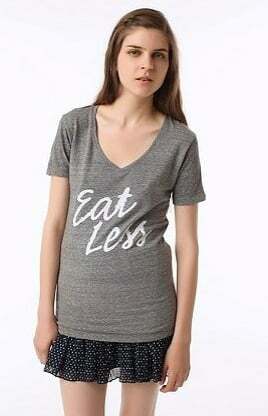 Styled Locks & Building Blocks: Eat Less - what a ridiculous notion! Sophia Bush has spoken out against the American chain Urban Outfitters who have on range a T-shirt which reads "Eat Less"
The actress release the following statement "To promote starvation? To promote anorexia, which leads to heart disease, bone density loss, and a slew of other health problems, not least of all psychological issues that NEVER go away? Shame on you. I will no longer be shopping at your stores. And I will encourage the tens of thousands of female supporters I have to do the same."